Dunder is a bright and friendly online casino. It draws in players with a stunning homepage featuring a beach scene, and this leads on to a huge range of slots. Games are available from a number of big-name software providers, including Betsoft, NYX Gaming and Play'n GO. Launched in 2016, Dunder online casino does not accept accounts from the US, and most players hail from Europe. The interface is smooth and easy to navigate throughout, with a good level of responsiveness and a user-friendly layout. Customer support is available during the daylight hours through a live chat option or by email. There is no phone number, but an extensive FAQs section has been provided so that members can seek out answers themselves. The casino is operated by MT Secure Trade. This company is fully licensed in the UK by the UK Gambling Commission and in Malta by the Malta Gaming Authority. The website itself runs on the iGaming Cloud platform developed by the global Gaming Innovation Group, which promotes fun and fairness in its products. The focus here is definitely on slots, which make up a far larger area of the site than the video poker or table games. Bonuses are made available to Dunder account holders regularly. Most of these require a deposit, but others will be completely free. A bonus could take the form of cash or spins on specific games. Players are usually contacted through email or text message when they become eligible for a bonus, but it’s also worth checking in regularly to see what is advertised on the home page. The only permanent bonus is the welcome offer. Unlike many other online casinos, Dunder does not have a tiered membership system. The bonuses on offer are usually provided to everyone, rather than being targeted at VIP members or particularly active players. This is an attractive feature for newcomers, but when people have been playing at one casino for a while, they may expect their loyalty to be rewarded. A plus point of the Dunder bonus range is that no request has to be sent to the casino in order for the spins or cash to be obtained. Members just need to log into their account, click the My Dunder tab and select the bonus that they wish to receive. 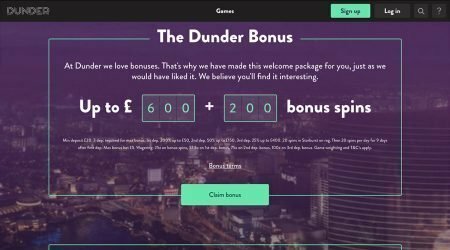 The welcome bonus at Dunder, like those at many other casinos, relies heavily on gamers being very active on the site in terms of making regular deposits and plays. In essence, it consists of up to £600 in three bonuses, followed by a package of 20 and then 180 free spins. The bonus offer kicks in when an account is registered, and just for completing this process, Dunder gives players 20 free spins to get them started on the platform. When a deposit is made, the casino triples the amount up to a total of £50 and provides 180 free spins in the Starburst game and 20 daily spins for the next nine days. As an example, players can deposit £25 to get £75 in bonus cash. The second part of its bonus works in the same way, but it adds 50% onto the amount deposited up to £150, so £300 paid in will leave players with £450. The third deposit attracts the biggest bonus, with an extra 25% available and a possible £400 bonus in total. If players are willing to pay in £1,600, then they will have £2,000 in their kitty. When players agree to accept a bonus from Dunder, they will need to wager a certain amount before they are able to withdraw any profit they make from it. Any money they have paid in as a deposit can be taken out, but if this is done prior to meeting the wagering requirements, then the bonus is forfeit. The wagering requirement for bonuses is 25 times the amount of the bonus, as well as the deposit amount. Any winnings that are received as a result of bonus spins have a wagering requirement of 25 times their value. However, Dunder has decided that certain games will contribute differently from others. For slots, it is 100%, and for table games, it is 10%. Certain other titles, including Kings of Chicago, Blood Suckers, 1429 Uncharted Seas and all video pokers, are also 10%. These are the general wagering requirements, but the details can be different depending on the bonus to which they are attached. Players should always take a look at what is involved before accepting a bonus. Dunder frequently provides free spins to its members. 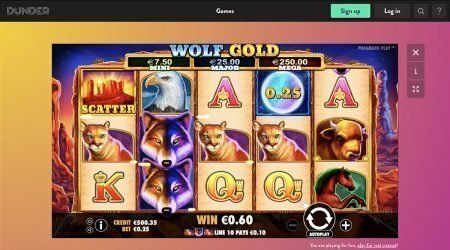 This provides extra chances to win along with a raft of other features such as multiple winnings, increased payouts, stacked symbols and sticky wilds. Occasionally, a combination of these will be available. Often, promotions like these tie in with the launch of new titles, but they are sometimes randomly offered on individual games. Slots dominate the action at Dunder. The site is packed with video and classic titles from more than 20 different software companies. There are over 1,000 individual games to choose from, each with its own unique style of play. One of the ways that this casino gives players something new is in its search function. New titles can be discovered for the first time, and old favourites can be located through a search based on specific characteristics, such as expanding wilds or cascading reels. Alternatively, a search can be based on the narrative theme of a game, such as Winter, Animals, Retro or Superheroes. The final category to search by is the game designer, so if players have a preference for a certain software developer and want to try out more of its titles, then it’s easy to do this at Dunder. The collection has examples from jackpot slots, video titles, classic games and 3D slots, along with mobile games, bingo, keno and virtual fruit machines. There is also a series of Vegas-style slots, along with table games, and live dealer action is provided by Evolution gaming. In terms of big-name titles, Starburst, Gonzo’s Quest and Mega Fortune are provided by NetEnt, while Microgaming sets up Break Da Bank and Lucky Links. A standout title is Mega Moolah – one of the world’s best-loved progressive slots – where players can build up their winnings every day. The total jackpot for this title at Dunder is a massive £1m, but smaller prizes are much more common. Dunder has invested in a selection of games that not only look great, with engaging visuals and stellar features, but also sound just right. Expect the noises of a real-life casino, matched with inventive themes and great storylines. When players are logged into a Dunder account, they can simply click Balance in the menu bar, followed by Deposit, to pay in funds. The full range of deposit methods available in their region will be shown, and from here they can follow the instructions. Each option is instant and free of charge. The payment methods include credit cards such as Visa and Mastercard, along with online wallets such as Skrill, Neteller and paysafecard. According to the website, there is always a representative on hand to assist account holders with any problems that may arise, but live support is only available between 9am and 11.30pm. Unfortunately, the casino does not have a customer care phone number to call, which many people prefer. It does provide a chat box, which can be accessed by clicking on it from the How Can We Help You? page. Members have to supply their name and their email address in order to initiate the chat. The only alternative is emailing them on [email protected], for a reply within 24 hours. In customer reviews, it is clear that the majority of people have had a good experience when contacting Dunder support. The staff are friendly and capable, and their response times are short. 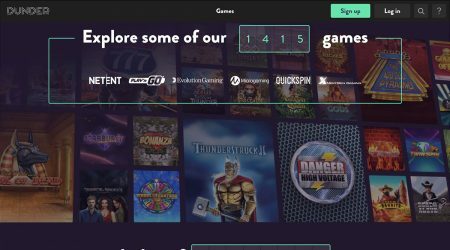 Dunder casino, with its instant play slots, was launched by gaming enthusiasts, and their passion for the industry is clear throughout the site. 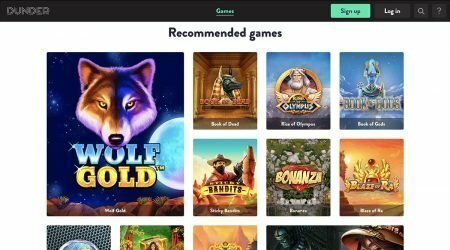 From the vibrant front page to the colourfully presented slots and unconventional presentation, it is clear that this company wants to make a break from the traditional look of online casinos. The website design is undeniably contemporary, with clean gaming environments that are not flooded with ads and a modern aesthetic that boasts rich graphic elements. The game selection is equally impressive with hundreds of titles drawn from the best-known software providers in the industry. Along with all the old favourites, players can try out plenty of next-generation titles on slots, as well as live gaming. Security is a major issue for anyone providing their financial details to a company online and spending money. At Dunder, customers’ personal and account information are safeguarded under strict EU legislation, because the casino is licensed by the Gambling Commission of the UK, as well as the Malta Gaming Authority. These are two of the world’s most well-respected authorities, so members can feel secure at Dunder.